Credit Card Debt: A Recurring Nightmare? The Federal Reserve published its monthly G.19 statistical release of consumer credit on Feb. 7, and, as many expected, it revealed another uptick in household borrowing. In December alone, the month the figures covered, it rose at an annualized rate of 9.3 percent. At the end of 2011, we as a nation owed some $90 billion more than we did at the end of 2010. Revolving credit, which is virtually all credit card debt, had fallen in 32 of the previous 37 months, but was up again in December, the third consecutive monthly rise. As with the wider consumer credit measure, after two years of successive and significant falls (9.6 percent in 2009 and 7.5 percent in 2010), credit card debt actually rose very slightly between the start and end of 2011. Problem credit card debt returning to haunt us? If you go out to malls in the wealthy areas of America today, people are charging up a storm. 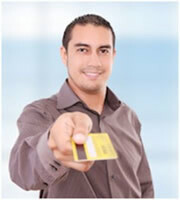 In all, Americans charged a whopping 2.5 trillion dollars on their credit cards during 2011. Way too many people have already forgotten the lessons that we all learned back in 2008. Of course some Americans pay off their credit cards every month, but way too many Americans are not doing that. In 1980, Americans were carrying 54 million dollars in revolving credit balances. Today, Americans are carrying 794 million dollars in revolving credit balances. Making a beeline for recovery? Snyder makes a persuasive case for the financial meltdown he predicts. However, the late John Kenneth Galbraith, a celebrated (by some) Harvard economics professor, put such apocalyptic visions into context back in 1952 in his book "American Capitalism." On the first page of that volume, he drew an analogy between the American economy and a bee: "It is told that such are the aerodynamics and wing-loading of the bumblebee that, in principle, it cannot fly." But it does, and for way more than 60 years our economy has been flying in practice (with periodic soars and plummets), even though there are countless theoretical reasons why it shouldn't. And not all the news is bad. January's edition of McKinsey Quarterly, published by the eponymous management consulting firm, included an article that explored how the United States was deleveraging household debt by comparison with some other advanced countries. And, generally speaking, we're doing much better than those others. The U.K., for example, has reduced that measure by 6 percent since it started the process, and Spain by 4 percent. The United States has achieved a remarkable 11 percent. Meanwhile, unemployment in both those European nations is on an upward trend while here, happily, it's decidedly not. Moreover, the news in this country is even better for the debt service ratio. That, according to an OECD definition, is "the ratio of debt service payments (interest and principal payments due) during a year, expressed as a percentage of exports (typically of goods and services) for that year… a key indicator of a country's debt burden." And McKinsey says that, for U.S. households: "it's now down to 11.5 percent -- well below the peak of 14.0 percent, in the third quarter of 2007, and lower than it was even at the start of the bubble, in 2000." Or taking the road to ruin? McKinsey's household debt data include borrowing tied to real estate such as mortgages and home equity lines of credit, while the Fed's consumer credit figures don't. So they're not immediately comparable. That partly explains why McKinsey published a graph showing US household debt as a percentage of gross disposable income. This suggests a smooth downward line over the past two or three years, and then a dotted line on pretty much the same trajectory showing a projection that takes us to the second quarter of 2013, by which time we're supposedly going to be back on trend after the inflation and bursting of the credit bubble. That paints a soothing and reassuring picture. However, if you look just at student loans, credit cards, auto loans and other consumer borrowing that isn't secured on housing, then things look very different. So how worried should we be? Well, the simple fact is, nobody knows. Not many mainstream economists share Michael Snyder's doom-and-gloom prognosis, but that means very little. Remember the last time mainstream economists smugly believed they had all the answers? You don't have to think back further than 2007/8. And, at the risk of irritating regular readers with the repetition of this blogger's favorite J.K. Galbraith quotation: "The only function of economic forecasting is to make astrology look respectable." You might have noticed that every single headline and subhead in this blog ends with a question mark. That's because your blogger shares one single characteristic with every world-class economist on the planet: he hasn't the faintest idea what's going to happen to the economy tomorrow, let alone in six months' time. But he would suggest to anyone who's feeling relaxed about their finances and tempted to run up significant levels of credit card debt that they should, unless they're keen gamblers, think again. 0 Responses to "Credit card debt: Back to the bad old days?"